This past weekend, we flew to Taipei on Jetstar Asia Airways. This is significant for only two reasons. The first is the price. Jetstar is one of Asia’s new budget airlines. The advent of these new airlines has made regional travel suddenly very affordable. Flights that were once between S$700 to S$800 are now between S$200 to $400. Flights that were once a few hundred dollars are now sometimes as cheap as S$20 to S$30. Our flight to Taipei was only S$342 a person (we’ll be flying to Hong Kong next week for only S$277 each), cheap compared to what we would have paid a year ago. However, low cost means no frills. Drinks and food, while available on board, aren’t free. Not that we’d want to buy any of Jetstar’s inflight meals. What we’ve seen so far has been pretty terrifying. S and I have always liked to pack snacks when flying. Usually that might mean some sandwiches or a can of “rillette d’oie”–nothing too heavy since even the worst airline can be depended on to serve nuts, bread, or some other palatable snacks. But flying Jetstar necessitates packing properly and packing anything and everything we’d want to eat or drink. For our flight to Taipei, S decided to make some delicious individual Quiche Lorraines. I love quiche. As a food, it combines two of my favourite things, pastry and egg. Add to this an endless variety of yummy ingredients (for example, bacon, mushrooms, spinach, cheese, crabmeat, leeks, etc) and you have what might be one of the most perfect foods ever invented. I should also admit that I didn’t know S was making these for our flight. I discovered them after coming home from work. They were cooling in the kitchen, as pictured above. What a wonderful vision. The aromas were equally heady, with the smells of bacon, egg, cheese and pastry filling the house. I was extremely tempted to eat one right there and then, depriving myself of an inflight meal but satisfying my greed immediately. S, of course, wouldn’t let me. And she was right not to. Without any other forms of (free) inflight entertainment–other than my ipod and the latest Harry Potter–my Quiche Lorraine was not only a wonderful meal but a great way to pass the better part of a half an hour. Every baker has his or her own favourite pie crust recipe. If you’re looking for a good recipe to start with, S recommends the basic pie crust recipe in The King Arthur Flour Baker’s Companion (p408), using a mixture of all-purpose flour and pastry flour, replacing shortening with more butter. The two step method of cutting in the fat gives you a pastry with a lovely mixture of flakiness and crumbliness. Pre-heat oven to 375ºF. Blind-bake the pastry shells in the 4 pans until lightly golden brown (yes, that means you’ll have to use pie weights, beans or rice). Remove them from the oven but leave the oven on at the same temperature. Fry the bacon in a skillet until crisp. Transfer to a plate lined with paper towels. Whisk the remaining ingredients, except the cheese, in a medium bowl. Spread the cheese and bacon evenly over the bottom of the pans. Pour the egg mixture into the pans until almost but not entirely filled. Bake until golden brown, a knife blade inserted into the quiche (half an inch away from the crust) comes out clean and the centre feels set but wobbly (roughly 25 minutes for mini quiches). Transfer to a rack to cool. They will continue cooking in their own heat. What a perfect idea on S’s part! Those look to die for. I must say, a well-made quiche, with flaky pastry and rich (but not cloying) filling is art unto itself. I’m particularly fond of a combination with mushrooms, goat cheese, and carmelized onions, seasoned with a touch of thyme. Perfect for cooler months. But Lorraine will always be a beloved classic. That is just too sweet. What a thoughtful thing to make such a wonderful treat for your flight! ah harry potter! is the new one good? I read all the others last summer. ipods are addictive. quiche sounds excellente! What a wonderful marriage you have. I love the title of your post as well. I will try this recipe this weekend, thanks! i too, love quiches. so easy to prepare and leaves you free to do other things while it’s baking in the oven. tara: Hmmm… mushrooms, chevre, and caramelized onions sounds like a killer combination. I’ll have the try that soon. meg: Yah, she’s the best! Saffron: Thanks. As I’ve written many times, I’m kept very well-fed and very happy. bullseye: I hope it comes out well. chubby cat: Thanks. Yah, it’s wonderful to laze around while something wonderful is baking away in the oven. Very nice food blog and via Cook Next Door, saw yours on the tree and I thought that it sounded interesting so here I am! Clean slate and spectacular photos of food in your blog, very nice! it’s going to be a longgggggg wait for HP7! Just happened upon you site from a comment on KIPLog. Good stuff and great photos. By the way, I must say that these cute little darlings have totally appealed to my love of all things miniature. I’d had my eye set on some miniature bundt pans and crumb cake molds, but now springforms need to be added to my list. these are kaiser mini springform pans that we ordered off amazon a couple of years ago. they come in a set of four. the mini loose bottomed cheesecake pans at the baker’s catalogue are really tempting too. re: potter yeah, I read all of them in my compulsive manner last summer except for the latest, just can’t drop the mula on a hardcover right now besides I’m shortening my wait for the 7th one the longer I wait to read this one. reading your blog makes me not want to remain a veggie (but don’t get yer hopes up). cheers! Thanks so much for the heads up, S! The ones I was looking at were more expensive (Williams-Sonoma). These were the mini bundts I was in love with. I found them wholly adorable. 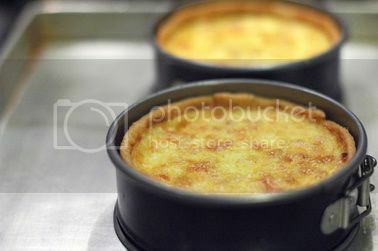 They also sell the loose-bottom mini cheesecake and mini crumbcake pans. Tara, I highly recommend the Kaiser pans. They’re truly non-stick. I don’t butter them at all. The only draw back is that at 4.5inches across, it’s a pretty large portion for one person. The bundt pans are too cute! Do you have any favourite inspirational cooksbooks for sweet/savory miniatures? Hello! I was wondering if you could enable the site feed for your new url? when I try and subscribe to the feed on your new site, it’s linked to your old url, which you don’t update anymore. lil: yah, way too long. andrea: C’mon, go get that White Castle Slider I know you secretly want. enuwy: Thanks for heads-up. Forgot entirely to do that. Done now. Wat a great idea to have quiche! It doesn’t taste yucky even when it’s not warmed up. U always haf great pics which makes me drool…..